I VPN'd into my work network -- by connecting to a RAS server in Reno. I expected to see Reno advertising. But interestingly, after refreshing the State homepage 5 or 6 times, all of the ads were location-agnostic. Which doesn't disprove your theory. My guess is that my http headers contain headers from both my Spokane connection and the gateway in Reno, and maybe others (my corp network spread across the NW, so who know where my requests originate from). If the ad software can't make a pretty good guess, then perhaps it just throws up location-agnostic ads? Or maybe it was just a fluke? 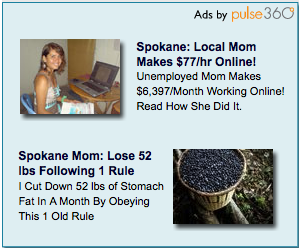 Maybe the Spokane woman really did have whiter teeth and loose more weight. You could too Hank! I teather via my BlackBerry and can get stuff from Reno, Los Angeles, and most often (and interestingly) Dubai.